Famed for her many adventures, Frances made her debut with this title over thirty years ago. In this first Frances book, the little badger adroitly delays her bedtime with requests for kisses and milk, and concerns over tigers and giants and things going bump in the night. Long a favorite for the gentle humor of its familiar going to bed ritual, Bedtime for Frances is at last available with the warmth of full color enriching Garth Williams's original art. Famed for her many adventures, Frances made her debut with this title over thirty years ago. 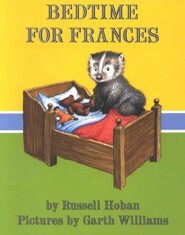 In this first Frances book, the little badger adroitly delays her bedtime with requests for kisses and milk, and concerns over tigers and giants and things going bump in the night. Long a favorite for the gentle humor of its familiar going to bed ritual, Bedtime for Frances is at last available with the warmth of full color enriching Garth Williams’s original nuanced and touching art. ‘Here is the coziest, most beguiling bedtime story in many a day.’—Kirkus Reviews (pointer). I'm the author/artist and I want to review Bedtime for Frances.